Buscot Park was built by Edward Loveden Townsend in the 1770's. The house is a dignified example of late 18th century taste for Italianate country houses, inspired by the architecture of the great Renaissance architect, Andrea Palladio. A subsequent owner, Robert Tertius Campbell, returned to Australia in 1887, having spent a large fortune on turning Buscot into a model agricultural estate. Buscot was then sold to Alexander Henderson, later the 1st Lord Faringdon, a city financier of exceptional ability. He bought paintings by Rembrandt, Murillo, Reynolds and Burne-Jones, establishing a solid core of the Faringdon Collection. Gavin Henderson the 1st Lord Faringdon's grandson and heir added the bulk of the pictures to be seen at Buscot Park today. He also remodelled the house by removing heavy Victorian additions. 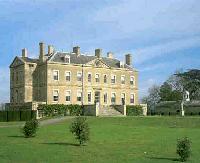 The present Lord Faringdon lives at Buscot Park, administering the park on behalf of the National Trust. On the A417 between Faringdon and Lechlade.